In the Bronx as in the other boroughs/counties, DOC transports inmate to and from the courts. The holding facilities for inmates making court appearances are located in or connected to the courthouses. These include the Supreme Courts, the Criminal Courts, and the Family Courts. 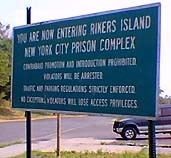 The Bronx also is home to the Department's firearms range at Rodmans Neck near City Island and the City Cemetery, also known as Potters Field, on Hart Island. Bronx House of Detention for Men -- located in the Bronx Terminal Market area -- was built in 1938. Additions were completed in 1963. It can house 469 inmates, many of whom face trial in Bronx County. BxHDM is one of the Department's reserve facilities closed or opened as needed by the jail system in response to inmate population fluctuations. The Vernon C. Bain Center is an 800-bed barge built in New Orleans, La. at a cost of $161 million. When used by DOC, the facility can house medium to maximum security inmates in 16 dormitories and 100 cells. Opened in the Fall of 1992, it is named for a well-liked warden who died in a car accident. ACKNOWLEDGMENT: We gratefully acknowledge NYC DOC's permission to post here material used in creating the original version of the NYC DOC web page posted on NYC LINK.